OAKWOOD'S NOSTALGIA: Friday Night is STEAK NIGHT! I see myself going back for something more. The food, the drinks and of course the company makes everything delightful in NOSTALGIA. Away from the traffic of the metro, OAKWOOD'S NOSTALGIA makes an impressive mark on relaxation and delicious food. The vibe is old school. Letting everyone remember the past. Remembering what used to be. The good old times. Aside from the different "antiques" on display, the resident pianist is there to soothe our nerves. After a stressful week, you need a break. NOSTALGIA would definitely deliver on that. You might want to get a glass of something from their extensive drink list. Cocktails and wines are there for the choosing. For this FRIDAY STEAK NIGHT, a basket of bread and butter was laid in front of us. I figured that ONION GRATINE or FRENCH ONION SOUP (375Php) would be perfect to start the meal. INCREDIBLE. You know how other restaurants seem to always put little cheese in theirs? NOSTALGIA'S version is way more generous. Spoon after spoon, the Emmental cheese was there. It was as if it wasn't going away. I liked it so much that I think I over did it. For our STEAK DINNER, I figured I would go with a safe bet. US ANGUS RIB EYE (Php1,645). It came with a choice of side dish and sauce. I got the CREAMED SPINACH. It wasn't too creamy and was just right. It was a balanced Popeye Veggie! And here came the steak. 7oz of tender perfection. Cooked to my specification. Soft as a baby's bottom. The meat was done perfectly. Bite after bite, I enjoyed. Along with the merlot shallots based sauce, I devoured this. Honestly speaking, you really wouldn't need any sauce. IT stands perfectly on its own. Honestly, I was almost full but the whole point of having a meal is getting to dessert. BAKED CHOCO and HAZELNUT CHEESECAKE (320Php). Smooth texture. Tasted more chocolatey than cheesecake. It was good. The crust was not your normal graham cracker. It was different. DECONSTRUCTED BLACK FOREST (325Php). If you are thinking that this would taste like any other bake shop's dessert, then you are wrong. Pudding, choco cake, and a splash of fruits makes this amazing. If I wasn't full, I would have gotten another one of this baby. Ambiance and taste has a price. OAKWOOD'S NOSTALGIA is a perfect setting for that power meeting or a rendezvous with someone special. They know how to set the mood for any event. Friday night's would be incredible as they now serve STEAK. US ANGUS STEAK. Cooked to your liking. Something manly and delicious. A treat for reaching the weekend. Disclaimer: was invited to try this out. Wrote this based on my experience. 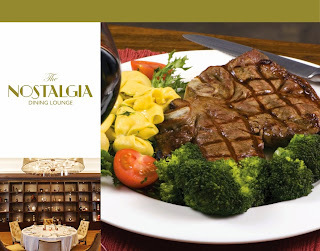 "Feast on the juiciest steaks and stellar choices of sauces and sidings at a one-of-a-kind evening spent at the cozy and inviting Nostalgia Dining Lounge to celebrate the end of the week. Savor US Angus steaks or the sumptuous bestsellers of Chef Jerome Cartailler with family and friends on a delightful gourmet dinner complemented by the soothing tunes of our guest pianist. Available every Friday, from 6.00 PM - 11.00 PM at The Nostalgia Dining Lounge. " For reservations, please call 63.2.719.1160 (direct line) or 63.2.637.7888 ext. 8604 or email premiermanila@oakwoodasia.com.